‘A Cave Within’, Snehadhara’s two-day workshop that offered a space of insights to look within as one explores a relationship with the world around. “The way out is the way within…………. As we traverse the self-imposed routines of our lives, layers upon layers of life’s complexities are woven in a maze which seems inextricable and one that we feel we can never unravel. The Cave Within brought about the unfolding of a path through symbols for the parents who have busy lives where they only think of their children. To have the pause in their daily life to look within, brought out through art, elicited self-discovery, insight and a curiosity along with enthusiasm to know their own selves. 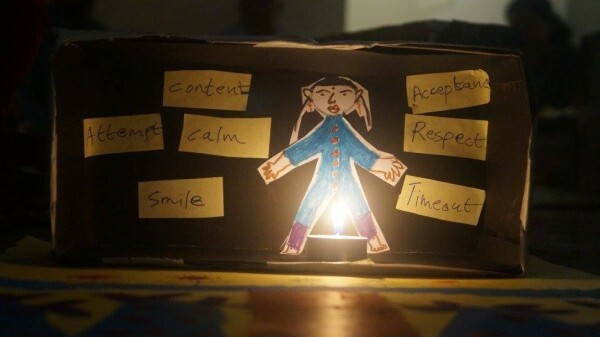 The Cave Within was made with a box and chart papers and an inner child was brought about that held the antidote to the obstacles that led to the cave within … The antidote of mindfulness …..To loneliness, it led to a deeply contemplative question. With deep gratitude, we applaud the participants for allowing themselves and us, into their cave and being a part of this invaluable experience. It is rare for a group to connect so beautifully with each other and with one’s own spirit in a crowd. It’s with this we understood that the community of parents had started the work on themselves which would lead to a larger, more supportive kinship.